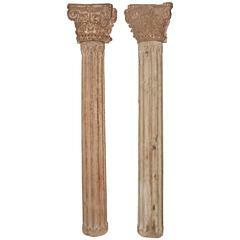 The antique Corinthian pilaster capitals are made of hand-carved hardwood. They are embellished with leaves and flowers. Leaves even protrude from the scrolls, which according to ancient theory are based on ram's horns. Can be used as side table or decoration. Museum Corinthian chapter, wood gilded, 18th century. Chapter solid wood carved and gilded. Very decorative and very old, circa 1740. (V135).